There are few pleasures in life that match being a grandmother especially as the children get older and you can relate to them as people apart from their parents. My grandson Alexander is at that age. He is approaching ten and he is a good kid. He’s a typical hyperresponsible eldest child, old for his age and caring of his younger sibs. We had a nice talk while he was out visiting and he asked me, very nicely and politely, if I could somehow fulfill his nine going on ten year’s old current dream. His bike was old and the brakes don’t work and he takes tumbles because the bike catches his clothing. It is a barely functional piece a junk. 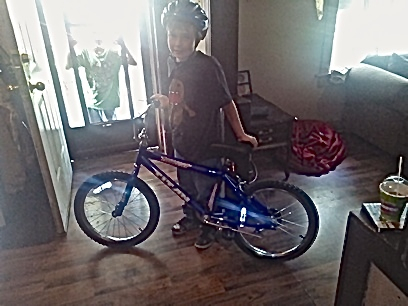 He wanted, he NEEDED, a working BMX bike. I said I would give it a try, no promises. Well I can’t cure cancer or bring world peace but I can do a grandmother thing. A BMX bike is not that grand of a dream, although at age nine going on ten, I expect it ranks right up there. So I hunted up a bike on Amazon that was decently priced and ordered it as a “for no reason but that Grandma (and Grandpa) loves you” surprise. I had it delivered to Alex’s house in his name. When it arrived I got a picture from my son showing a beaming child with his dream fulfilled. Some things in life are so easy to accomplish. Some joys are so simple to create for me and for Alex simultaneously. This entry was posted in Grandparenting, Retirement on August 22, 2014 by tumbleweedstumbling. Vodka infused with wild summer berries. There are hints everywhere that fall is coming. More yellow is appearing on the trees. The big blue stem is getting that end of season shaggy look before it goes to seed. The cattails are fully formed and the summer berries have given way to August fruit. We now have chokecherries, high bush cranberries, and wild plums in abundance. Every year when we go south we try to bring a gift for the various places we stop. I decided people have had enough wild rice and local jams and honey. I am making fruit infused vodka. The recipe is very simple. Start with a wide mouthed jam jar and loosely pack in some fresh fruit. Pour over 1/4-1/2 cup of sugar, depending on how sweet the fruit you start with is, and then pour over the fruit 100 proof vodka. The jar then has to sit somewhere handy and be shaken up once a day. Sugar will dissolve into high proof alcohol but very very slowly. After 6-8 weeks the infusion is finished. The alcohol takes on the fruit flavor and sweetened and slightly thickened by the sugar. I have made this recipe in the past and I had great success with apple and cinnamon. So this year I made two jars of apple cinnamon using cinnamon sticks and I substituted honey for the sugar. Honey also dissolves very slowly and gives a warmer flavour. A little jigger of this in tea in the evening is lovely. I also made a jar with lime, and orange. If I have any liquor left I’ll try a lemon one. Those all came out very nicely last year and they form a lovely mix for soda when company is over or can be sipped straight as a liquor. This year I decided to try with local wild berries. I have a jar of Saskatoon berries where the sugar has nicely dissolved. I have started a chokecherry jar. Since I am mildly allergic to chokecherries I will gift that somewhere we are passing through quickly. Tonight I picked wild plums a little on the tart side and those will be alcohol preserved as soon as they are nicely ripe. I would prefer to wait to let them ripen on the tree but the birds are too fast for that. As soon as the fruit is even marginally ripe they feast on it. When ripe these plums are a deep red almost purple. The ones I picked are red but more to orange and they are really tart. I think as a gift they will beat wild rice. This entry was posted in Uncategorized on August 20, 2014 by tumbleweedstumbling. August has arrived. August is my second favorite month in Manitoba. The mosquitos are almost gone. Most of the baby birds have fledged and joined their parents flying about in the bushes. These little ones can still be distinguished from their parents because they are smaller and their flight is still a bit choppy, but by migration time it will be hard to tell who are the parents and who are the babies. It’s fun to watch the parents after the babies have fledged. They relax and seem to be far less driven and far more willing to just sit quietly for a while. There is a lot less glorious song and a lot more quiet chirping. Since my own chicks have fledged some time ago, I can relate. It takes a visit from the grandchildren to remind me how much effort is involved in raising young. Like childbirth you tend to forget the pain and remember only the happy times. The wildflowers have shifted from mostly white asters to tall purple asters and the deep golden yellows of showy and mountain goldenrod and chocolate scented sunflowers. The big bluestem has fully headed out and has ripe pollen hanging from the turkey foot. The saskatoons have finished their course and been replaced with pin cherry and gooseberry. The pembina plums are just beginning to turn from dark inedible green to red. Chokecherries not far behind. Last year I didn’t get any plums because they are precious and rare in the park and I wasn’t fast enough. The heat continues. This is one thing I am not so fond of about summer. Temperatures too warm in the daytime and often to warm to sleep easily at night. Heat is relative of course. If this were Arizona it would be cool. Temperatures typically 28C to 30C daytime and 20C at night. Last night I had trouble sleeping first with the heat and then later because someone upset a skunk. It was the middle of the night and everything was very quiet so I have no idea what made him spray. 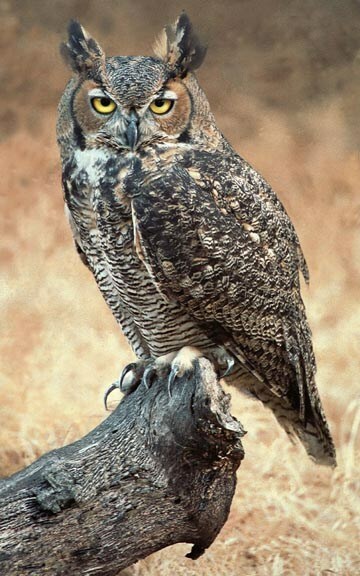 Perhaps it was a great grey owl. They hunt skunk because they lack an ability to smell. I don’t and so about 2:00 am I was left gasping with eyes burning and throat aching from skunk stink. We will get some mothballs today from the camp store and spread them under the trailer. For some reason skunks hate mothballs as much as we hate skunks. And house flies have begun to appear. By the end of the month and up until we have our first hard frost, the flies will dominate and drive me batty with their persistent buzz and fly specks on the ceiling and everything else they walk on. The ants have tried several times to take over the trailer but we have kept them at bay with ant traps and liquid spotting of poison on their trail forays into our home. Writing our book is progressing well. I only have so much energy for writing so my blogging has suffered but the other writing continues. We have a guest coming to stay in our campground with us Sunday. Bryan will stay two weeks. We won’t get much work done for that period but it will fun to have his company. This weekend is gazing at the stars weekend and I hope we don’t get rained out as we did last year. Hints of fall have begun. Dog bane in the shady spots has begun to yellow on the wooded floor. Poison ivy has white berries and is turning red. Many of the bushes have begun showing a few yellow leaves. September is my favorite month. The leaves turn and the flies vanish and the mosquitos are gone. In Manitoba there is no great display. Everything turns yellow and then drops in a short time. We might hit some real fall colour on our trip south. It will depend on when we leave. In September there are no ticks and yet wildflowers still bloom and the song birds stay. We have about three more weeks of heat. After that it will be too cold for most campers in tents at night. Half the campground will close. The campground internet, now too slow to be used, should pick up. September is coming. Meantime we have August to enjoy. This entry was posted in Uncategorized on August 7, 2014 by tumbleweedstumbling. Our trailer, like virtually all trailers, has PEX plumbing. There are a lot of advantages of PEX. It’s flexible. It’s Cheap. It’s easy to get parts. It’s easy to modify or change parts. It is more freeze resistant than copper. It takes a lot of abuse. It does have one annoying fault though. When stressed, instead of breaking the joints come loose. This results in leaking. The leaking occurs silently and without warning. I showered today and as I went into our bedroom to dress, I noticed a puddle. I assumed it was just a spill from not having the shower curtain set right. As I started mopping up it was soon clear it was a lot more water than that. Following the puddle backward I located the leak. One of the PEX plumbing joints where it is hooked onto an adapter that connects it to the hot water heater was dripping. For reasons I’m unsure of, the leaks always seem to appear where the PEX connects to solid stuff. When we are bumping up and down the road, the PEX piping flexes and whips with the bumps but things like the solidly bolted down hot water heater don’t. The joint is the part subjected to the most stress. At least that is my theory. Once located, such a leak is a really easy thing to fix. This time the joint had come so loose I could undo it further with just my fingers. I while ago a staff member at an Ace Hardware in Florida introduced us to a neat little tool for plumbing. 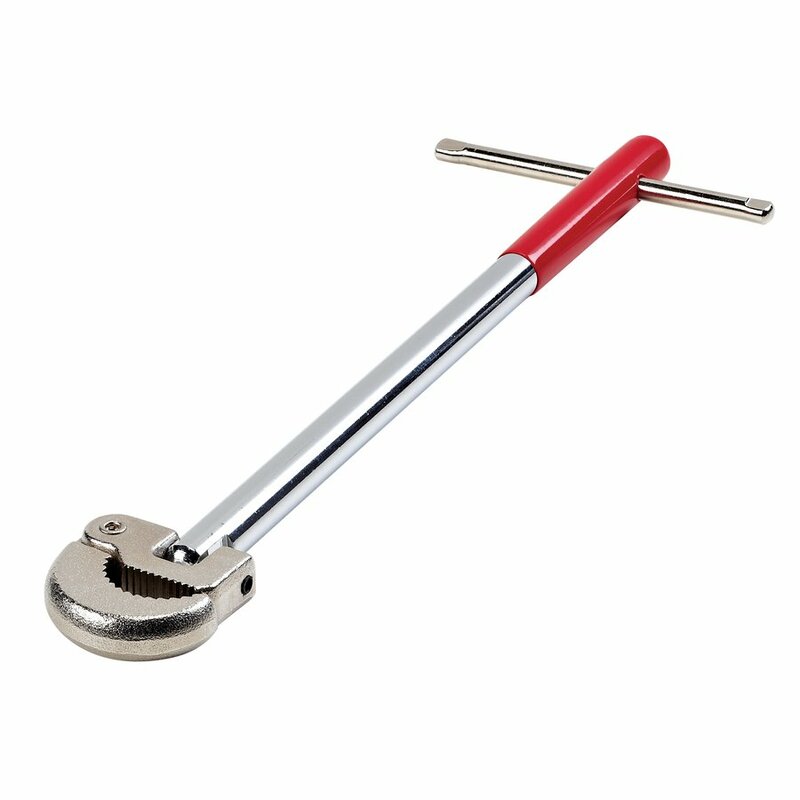 We bought the little wrench thingie and we find we use at least once a month. The wrench has a flexible flip top with ridges so it fits everything from garden hose to our PEX joints. The tool is high up in my “Must have” for RVers list. The tricky part about PEX is to tighten it just enough so it stops leaking but not so much that the plastic cracks. It’s a lot easier to tighten it compared to replacing the entire joint. Since I have the more delicate touch, I do the tightening. I have found I need to tighten it, leave everything open and running and watch carefully over the next 24 hours. Occasionally, I will find the joint I tightened is very slowly weeping and another twist is in order. PEX sells fancy calibrating wrenches to get the force exactly right. I have to wonder though, why bother? If it’s not leaking it’s not a problem and even at perfect calibration it is likely to come loose again anyway. I have considered some sort of maintenance check to be able to avoid a small flood. I have yet to find a loose one in advance. The loosening seems to be a sudden and one step spontaneous thing without forewarning. Because of this bad habit of PEX, if we are not going to be in our trailer for a few hours we always turn off the water. It is such a simple step on the way out and it can prevent a lot of damage. We turn the water off as often as we lock the doors. Our trailer interior is made of cheap press wood with plastic laminate. This is one way to keep the weight down enough to have living space without a semi to pull it. The interior gets wet and warps, expands and crumbles on prolonged exposure to water. It’s imperative to find leaks fast. It is equally imperative to clean up and dry everything as quickly as possible. So right now we have towels on all the places that got wet where floor meets walls and the dehumidifier going at full speed. The damage is also cumulative so a small leak one time may not cause a lot of trouble but a big leak or a small leak not quickly fixed or many small leaks, can degrade the walls. I think we got lucky this time. We caught the leak early and the damage will be minimal. We’ll see. This entry was posted in Uncategorized on August 1, 2014 by tumbleweedstumbling.